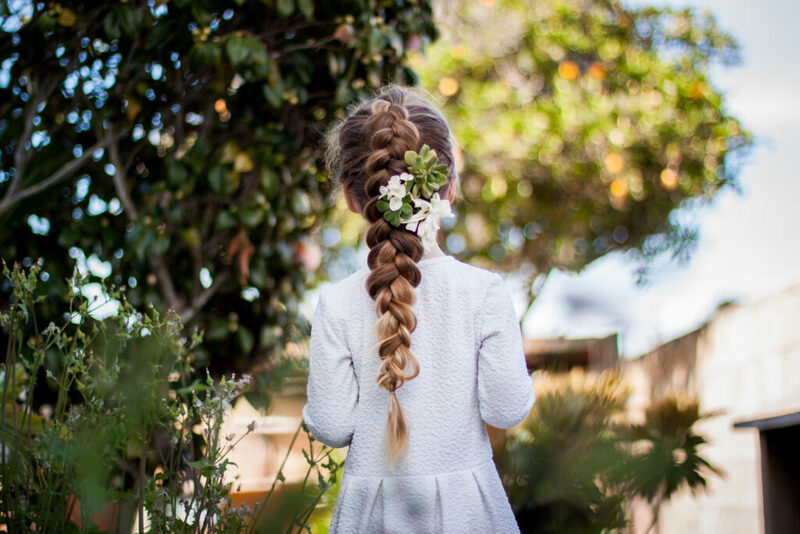 Spring is here and we couldn’t be more excited over here at Abella’s Braids! We are loving the warmer weater, bright colors and blossoms everywhere! I hadn’t even realized how desperate I was for a change in the weather until I started seeing all of the trees blossoming and everything turning green! It makes us so cheerful! 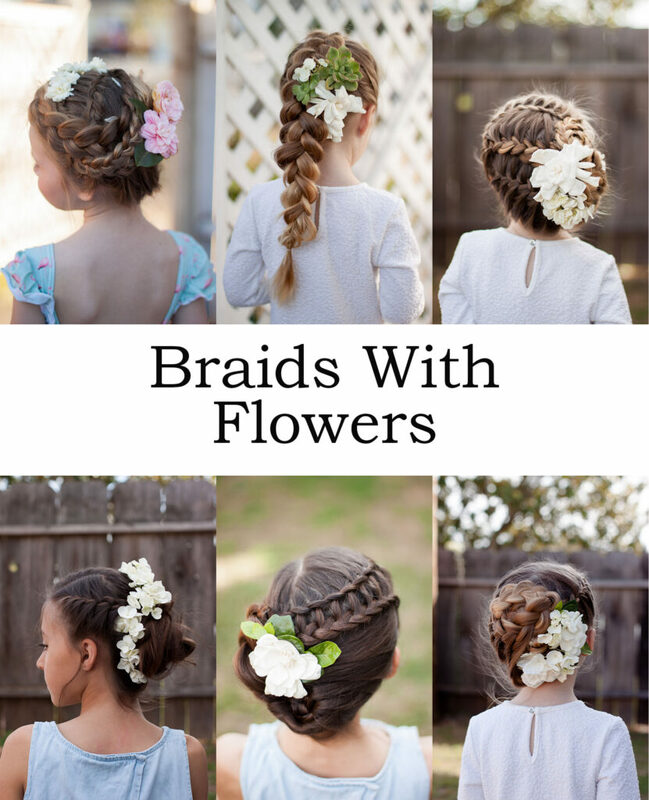 To get in the spirit of spring, we decided to show you a few different braids with some added fresh flowers! We picked most of them from around our neighborhood (with permission of course) and we had a lot of fun doing it! 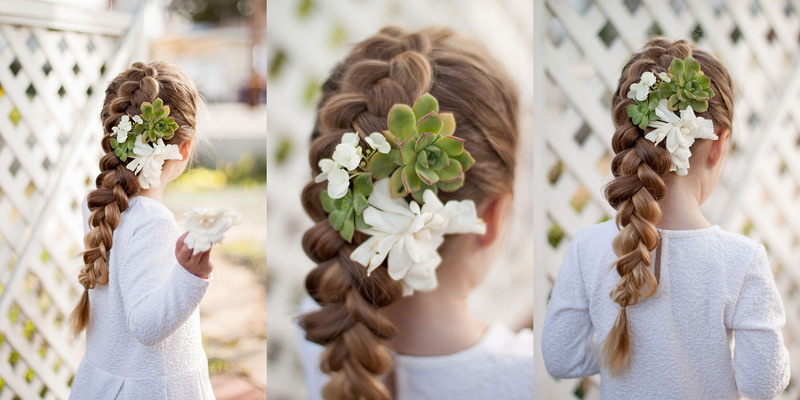 Flowers can really make a hairstyle pop, especially if it’s for a special occasion! If you’re going to wear flowers in your hair for a special occasion, I would advise you to check with your local florist on what kind of flowers hold up best for your special day! 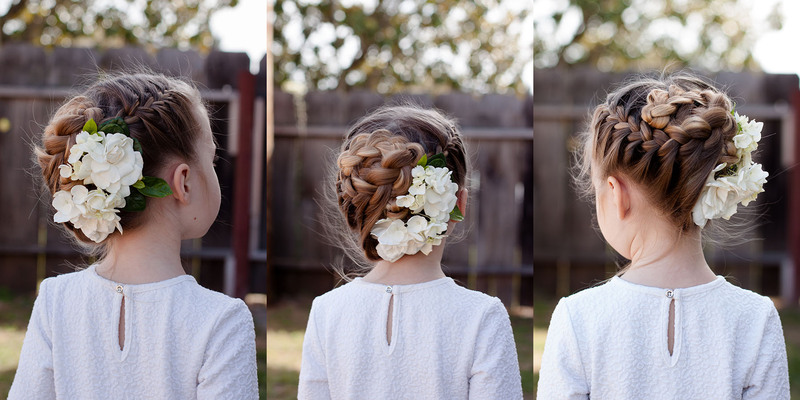 These hairstyles would be amazing for a flower girl, or even a bride! The best part is, all 6 were done on clean, dry, straight hair. No curling needed! If you have naturally curly hair, though, it would add beautiful texture to most of these styles! This first style was created using just French braids! I parted her hair on the side and French braided each side. The trick is, once you get close to the nape of the neck, only add hair in from the outer edge so you have room to wrap the hair higher on the head. Then you just wrap the braids around and pin them down. If you just do two French braids normally all the way down, it would look just as cute. Your pinned down braids would just have to sit lower on the head. I put the cluster of flowers down low on the side and we just love the way it turned out! These we SO fragrant and Charlie loved it! This style was parted on the side and French braided on the lighter side to about the hear. On the heavy side, I did a Dutch 5 strand French braid to the side and added the braid from the other side in when I reached it. I made a loose, messy bun with the remaining hair. I had originally intended to do a braided bun but her hair wasn’t long enough! I still loved it! Improvising is sometimes a must when you’re braiding because of layers, length and textures of different hair! I wanted to show you how amazing flowers can make even the simplest of braids look! 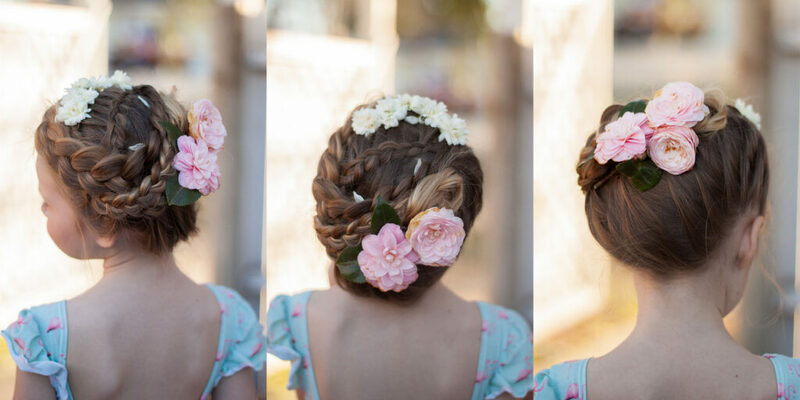 This is a Dutch pancaked braid and I added lots of flowers and some succulents on the side! I thought this look was just stunning but so simple! 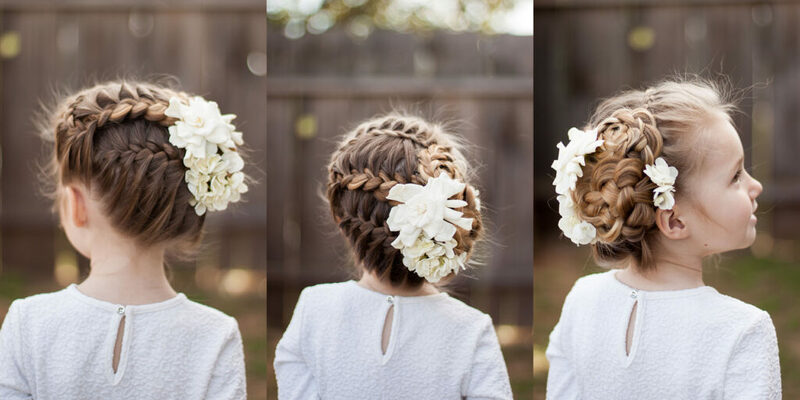 Or you could get super fancy with the braid and still add flowers. Just as stunning! I added some cute little flower pom poms to the ends of this style. 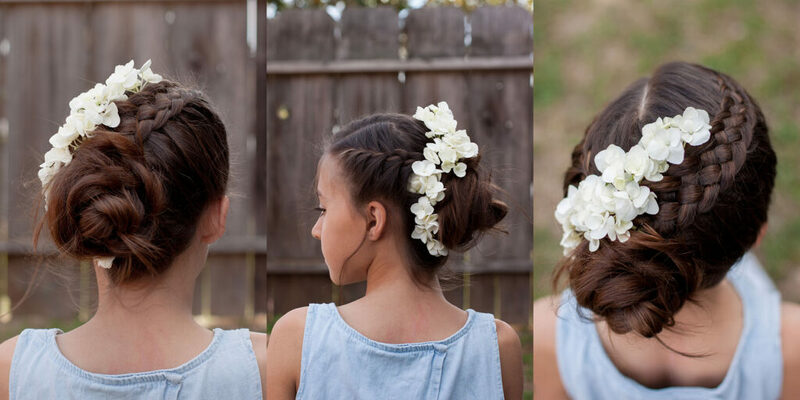 Just grab a couple of flowers, bunch them together and use an elastic to tie them to the end of the braid. If the stems show, just clip them off carefully with scissors. Thanks again for reading! We hope you found some inspiration from this post! Happy braiding! 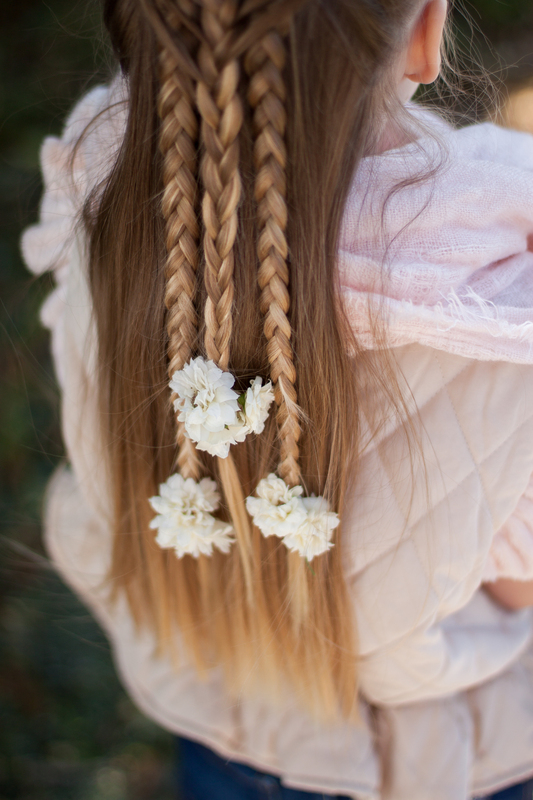 For more hair ideas and kids fashion, check out our website Abella’s Braids!